CHICAGO — Top-rated contender Adrian Granados opens up in an intimate interview with Sports Emmy® Award-Winning writer Mark Kriegel in the latest edition of the reoccurring SHOWTIME Sports® digital series, THE REVEAL with Mark Kriegel. CHICAGO (February 7, 2017) – Hard-hitting contender Adrian Granados hosted Chicago media at the Garfield Park District Fieldhouse Tuesday as he prepares for his main event showdown with former four-division world champion Adrien “The Problem” Broner Saturday, February 18 from the Cintas Center at Xavier University in Cincinnati and live on SHOWTIME. CHICAGO, IL, December 5, 2013 — The final press conference for “World Championship Boxing: Wlodarczyk vs. Fragomeni 3″ was held on Wednesday (December 4), night at Output Lounge Sports Bar in Chicago and all the combatants were respectful and confident ahead of their respective showdowns this Friday night at UIC Pavilion in Chicago. 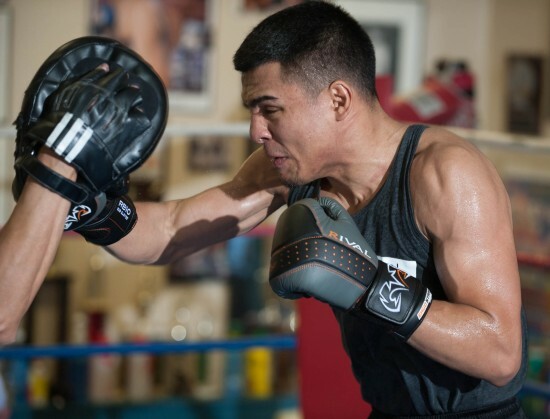 CHICAGO, IL, December 4, 2013 — Exciting light welterweight contender Adrian “El Tigre” Granados has heard it all before.